Back in 2004 your Chron was on the newsstands twice a day, six days a week. For a little nostalgia, here's what Brian the news vendor would've been yelling in Abington Street in the third week of January, 15 years ago (some sensitive stories may be pixelated). BUNGLING Government civil servants wrongly added more than 20 years of criminal convictions to a Northampton mans unblemished record. THE owner of a mobile phone shop was arrested for displaying a cheeky 20-foot banner above his shop about new phoning and driving laws - urging people not to be a "Tango Whisky Alpha Tango". 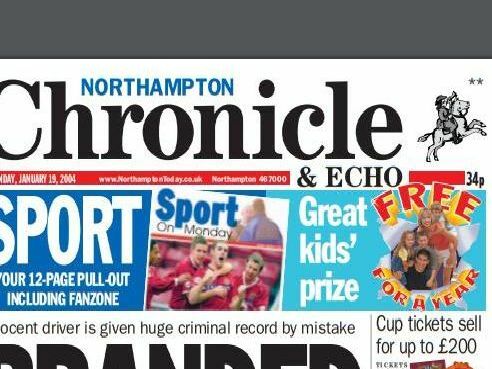 COBBLERS fanatic Mick Wilson was the luckiest man in Northampton after buying the last ticket for Sundays FA Cup clash with Manchester United. THE Governments top legal adviser has agreed to look into the Chrons campaign to name and shame a teenage tearaway.